Back from the brink. Again. Known in different parts of the UK as bog blutter, bumbagus or myre-dromble, among other names, bitterns are an elusive species. More often heard than seen, territorial males make a remarkable booming sound in spring. Bitterns once bred in all four UK countries. George Montagu, writing in the Ornithological Dictionary of British Birds in 1831, stated that in Scotland “the sound of the bittern is so very common that every child is familiar with it, though the birds, from being shy, are not often seen.” However, by the 1880s bitterns were considered extinct as a breeding species in the UK. Following recolonisation early in the 20th century, initially in the Norfolk Broads, numbers increased to a peak of about 80 booming males in the 1950s – most still in the Broads. There followed a steady decline, leading to a programme of monitoring and research from the late 1980s. This aimed to accurately determine numbers at the few sites where bitterns clung on into the 1980s, diagnose the causes of decline and identify a means of halting and then reversing it. In 1990, annual surveys were established. These used a new method combining mapping the territories of booming males using triangulation and then identifying them by the characteristics of their booming songs. Numbers continued to fall until 1997, when UK numbers reached a low point of just 11 booming males; mainly in Norfolk and Suffolk, with a small outlying population at Leighton Moss in Lancashire. From there, largely thanks to targeted conservation work, numbers started to increase. More than 100 boomers were recorded for the first time in 2011, rising to more than 150 in 2015. In 2018 there was a 13 per cent increase in the number of booming males since 2017, from 166 to 188, following the pattern of a year-on-year increase in each year since 2006. It is now not possible to monitor all sites for nesting activity, and has been the case since the last full census in 2011. We also no longer visit any active nests, but undertake long watches looking for regular female feeding flights at many sites. The nesting figures quoted in this article are only for nests where females are feeding young. From the sites monitored in 2018, confirmed or probable nesting activity from at least 79 nests was recorded at 37 sites, the highest annual total since monitoring of nests started in 1994. Major wetland habitat management, restoration and creation are ongoing and have played a major role in bringing bitterns back. And we use annual population monitoring as the main yardstick to measure its success. Today, some of the best places to see and hear bitterns are wetlands created since the mid-1990s. Since then, more than 80 reedbeds throughout the UK have benefitted, with many of these sites away from the traditional core East Anglia breeding areas. This encourages reoccupation of the bittern’s former range and provides the species with a sustainable long-term future in the UK. It is now only possible to achieve a full national survey each year with help from volunteers, landowners and conservation site staff. I’d like to say a big thank you to all of them at all reserves and sites. 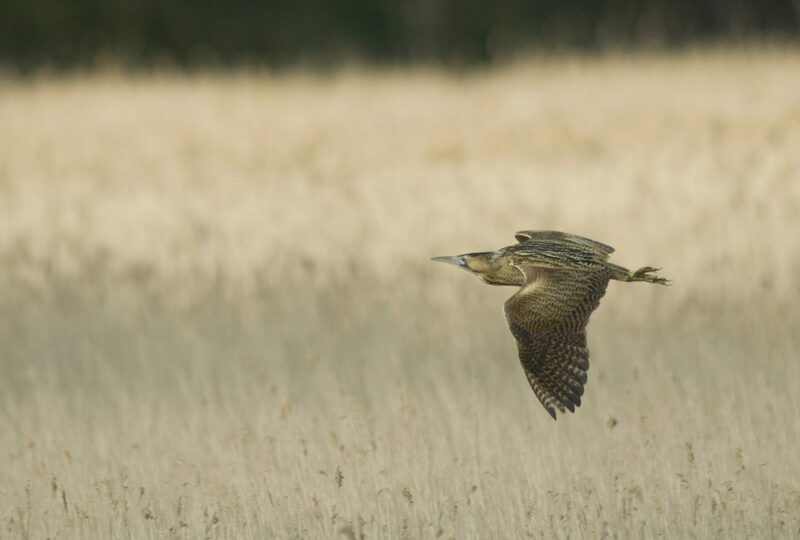 Bittern monitoring in the UK is part of Action for Birds in England, a conservation partnership between Natural England and the RSPB.